The Surface Pro has never been a bad idea. One device that's both your laptop and your tablet! Sounds great! The problem was that it was just never quite either; it was awkward on both counts. 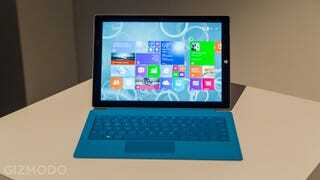 The new, bigger Surface Pro 3 though, might have actually found a way to walk the line. The first thing you'll notice picking up a Surface Pro 3 is that it doesn't feel like a Surface Pro. It's not a black, pretty-but-chunky monolithic slab. It feels more like a Surface 2, Surface Pro's RT-based, pure-tablet younger brother. It's far more iPad Air than laptop, which is seriously impressive for something with guts like this. The typically wonderful Surface design is in full effect here. This sucker is a pleasure to hold and behold. The angular edges still melt into your palms, and this sucker is thin and light enough that it's easily one-handable, though you might not want to try it for more than a few minutes. The new, improved fan that Microsoft touted during its announcement no doubt makes this smaller form-factor possible, and it is impressive; I couldn't tell if the fan was on or off when I was playing around with it (albeit in a noisy, drafty press lounge). What we did notice is that it got hot. Fast. And from little more than just zooming around the desktop. It's not oppressive unless you grab the upper back, but it's still a little concerning for a device you're supposed to spend much of the time holding. Of the many things that are new about the Surface Pro 3, the screen size feels the least remarkable. Yeah, it's bigger, but not in a way that's immediately stunning or noticeable. That's a good thing; the screen sort of fades away into the background right away without assaulting you with its largeness. I can't be exactly sure why, but I think because it feels more laptop than tablet, and as far as laptops go, 12 inches is reasonable, even smallish. Oh that screen looks puuuuurty. A change that is more noticeable from the get-go is the new hinge. Gone are the lovely snap-snap-snaps of hinges gone by. Instead, the Surface Pro 3 hinge clicks open with a snap that's a ghost of its predecessor's, and then proceeds to offer total freedom; some thick (and pleasant!) resistance lets you angle the stand anywhere you want between the min and the max. I'm sad to see the clicks go, but the sacrifice is well worth it for the extra options which make it better than ever to use on a lap. It's immediately clear that the addition of a second-stage last time around was a half-measure, and this is the full one. The freedom to pick whatever angle you want finally makes the Surface Pro a device that fits to your slouching style instead of one that expects you to fit it. Speaking of increased "lapability" (ugh), the Type Cover's new trick to fold up and mag-lock against the entire bottom bezel of the tablet really does help add to a sense of stability. It's no laptop hinge for sure, but it's closer. When it comes to actually typing, the Type Cover seems just about as good as what came before, which is to say that it's a totally workable keyboard, but takes a little getting used to. The increased size though will certainly help. Having a stand on your knees still feels weird and a little precarious, even if the wealth of angles help it to be more stable. It's not that the Surface Pro 3 is perfect for a lap, but more that its failings might be small enough to be forgivable this time. The stylus is a stylus. It feels pretty pen-like, and works well and with little latency on the screen. There's no place to store it in the tablet, but the Type Cover at least has a small loop for it this time. You'll still lose it though; I already misplaced it once. All told, the Surface Pro 3 feels like it's moved to more tablet-like by getting thinner and lighter, and more laptop like by getting a bigger screen and more lap-options courtesy of the new hinge. Only time will tell if it can effectively fit into life as either one of those (or both!) but one thing is for sure; the Surface Pro has never stood a better chance.